Discover our wide variety of wholesome treats and on-the-go snacks in the Free From Aisle or our online shop. And it doesn’t stop there. We’ve been producing delicious gluten free products for so long that we’ve even got our own dedicated bakery. Oh, and everything’s tested to standards approved by Coeliac UK of course! A coeliac diagnosis can feel understandably restrictive for some patients in what they can and can’t eat. However, the British Society of Gastroenterology recently confirmed that gluten free oats can be safely enjoyed by the majority of those with the condition – without any need to wait months after being diagnosed. Some coeliacs may find that they have a reaction to Avenin (a gluten-like protein found in oats), However, 95% of sufferers actually have a natural tolerance to it. High fibre, full of vitamins and minerals and with a low GI index (meaning they’re a great source of slow release of energy)... there are a lot of compelling reasons for coeliacs to try and keep oats in their diet. Find out more about The Benefits of Oats and you’ll be able to keep your patients updated on all the health benefits they might be missing out on. As one door closes another one opens - Nairn’s diverse product range and simple, natural and wholesome approach can become a safe go-to staple for your patients. Would you like to hear about all of our gluten free news and and new products? Then sign up for our e-newsletter. 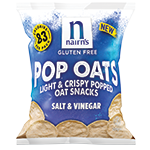 It's our way of staying in touch and letting you know what's going on with all things gluten free at Nairn's.